Peter Senge, founder and director of the Society for Organisational Learning and senior lecturer at MIT, has found the means of creating a 'learning organisation'. In The Fifth Discipline , he draws the blueprints for an organisation where people expand their capacity to create the results they truly desire, where new and expansive patterns of thinking are nutured, where collective aspiration is set free, and where people are contually learning together. The Fifth Discipline fuses these features together into a coherent body of theory and practice, making the whole of an organisation more effective than the sum of its parts. Mastering the disciplines will: *Reignite the spark of learning, driven by people focused on what truly matters to them. *Bridge teamwork into macro-creativity. *Free you from confining assumptions and mind-sets. *Teach you to see the forest and the trees. *End the struggle between work and family time. 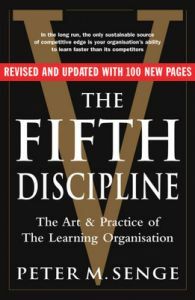 The Fifth Discipline is a remarkable book that draws on science, spiritual values, psychology, the cutting edge of management thought and Senge's work with leading companies which employ Fifth Discipline methods. Reading it provides a searching personal experience and a dramatic professional shift of mind. This edition contains more than 100 pages of new material about how companies are actually using and benefiting from Fifth Discipline practices, as well as a new foreword from Peter Senge about his work with the Fifth Discipline over the last 15 years. Dr Peter Senge is the founding chairperson of the Society for Organisational Learning and a senior lecturer at MIT. He has lectured extensively throughout the world, translating the abstract ideas of system theory into tools for better understanding of economic and organisational change. The Journal of Business Strategy named Dr Senge as one of the 24 people who had the greatest influence on business strategy over the last 100 years.